The Bowflex PR1000 Home Gym is a home gym most notable for targeting every part of the body. It offers a wide range of weight lifting workouts you can do, including a rowing option. The Bowflex brand has produced countless quality home gyms, and this one remains to be among the best. With the dozens of workouts you could do, you can have a bunch of workouts to do to stay fit. You literally have over 30 different possible strength exercises to do. This is a machine that can allow you to do bench presses, shoulder presses and raises, scapular retractions, seated lat rows, lower back extensions, bicep curls, leg presses, and a ton of different variations of those exercises. You can lift weights with this machine through the power of resistance. You can lift anywhere from 0 to 210 lbs. of resistance when lifting. You can do dozens of workouts and lift as much as 210 lbs. This is not only beneficial for weight lifting, but it could tone your body and truly develop every area effectively. You’ll never get bored when using this because of so many things you could do on it. It’s because of the Power Rod the resistance happens. This is a versatile home gym that can target any part of the body. It targets the back, shoulders, arms, legs, chest, and even your lower body. You can literally achieve your most perfect body from this machine alone. The quality control for this machine is very rigorous. It is made from a manufacturer from a high level composite of material, and it is properly tested around 4 times to make sure it is durable and lasts for a long time. The Power Rod units, which are used for adding resistance, can be flexed countless times on repeat, but it is nearly impossible to wear out the machine. The resistance is completely good for the body because it doesn’t pose any risks and injuries found from free weights. It could feel even better than traditional weight lifting. You don’t have to worry about your joints experiencing fatigue found from ordinary free weights. You receive a Workout Placard that displays all the descriptions on how to exercise and do the different movements. This makes it easy so you don’t get lost on how to setup for the exercises. You never have to worry about it ruining up your home and taking up too much space. The folding ability is the best part because you could hide it away for easy storage. Are there any downsides to using this home gym? For any guy looking to gain more weight, this can be a problem. It may not be enough weight in order to really get into bodybuilding. However, one fitness trainer did say that 200+ lbs. should be more than enough resistance in weight to gain muscle. A trick is to complete each exercise slower to really feel the burn. Your workout area should be a minimum of 100×78 in inches, so you need quite a big amount of space depending on the room. Without enough space, you won’t get to make the most out of this home gym and really do the exercises. It also has a maximum of 300+ lbs. at maximum, so you really can’t be too heavy to sit on this machine and use it. This home gym could be the best option for those who really want to achieve real success with muscle gain. Are results instant? There is no such thing as a machine that gives you results right away. It does take some time to see results. The resistance may not be as strong, but it sure does work if you move slowly during the workout. 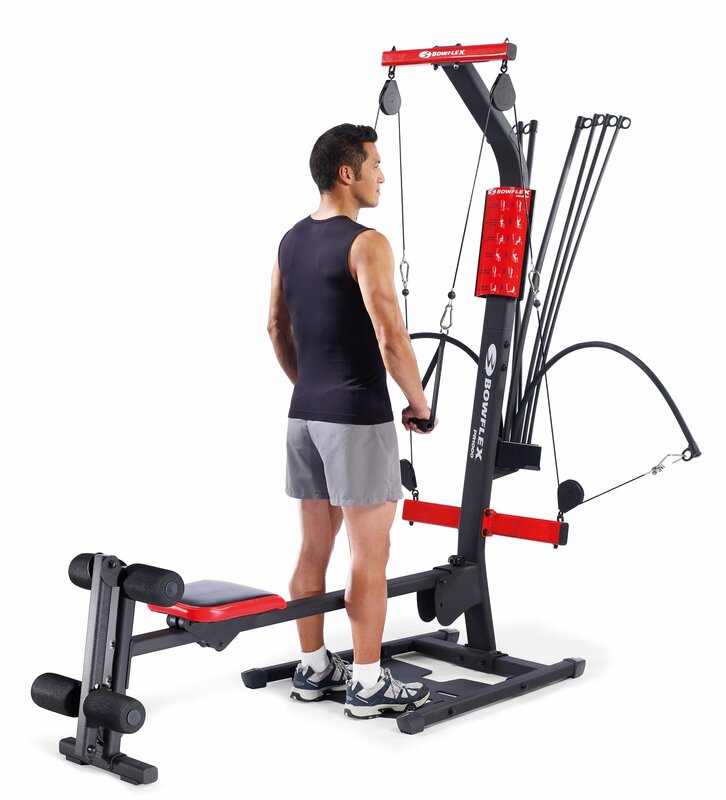 This is definitely one of the best to buy for anyone looking for a machine that offers dozens of exercises.